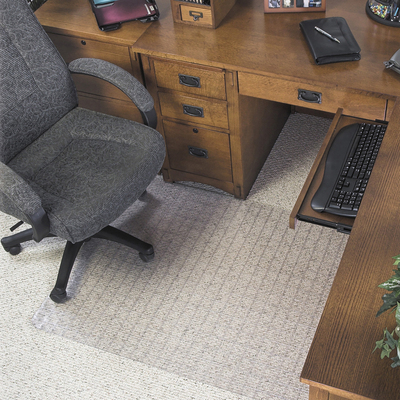 Checkered Chairmat Offers A Contemporary Style To Desk Space. Supermat Thickness Is Recommended For Medium-Pile To Low-Pile Carpets With Up To 3/4" Thickness. Checkered Design Grips Carpet To Hold The Mat In Place And Does Not Include Studs So It Won'T Pierce Or Damage Carpet Backing. Chairmat Features A Textured Top Surface And Beveled Edge For Smooth Chair Movement. Free And Clear Formula Produces An Exceptionally Clear Mat That Is Nonphthalate, Noncadmium, Bpa-Free And Lead-Free..
Checkered Chairmat Offers A Contemporary Style To Desk Space. Supermat Thickness Is Recommended For Medium-Pile To Low-Pile Carpets With Up To 3/4" Thickness. Checkered Design Grips Carpet To Hold The Mat In Place And Does Not Include Studs So It Won'T Pierce Or Damage Carpet Backing. Chairmat Features A Textured Top Surface And Beveled Edge For Smooth Chair Movement. Free And Clear Formula Produces An Exceptionally Clear Mat That Is Nonphthalate, Noncadmium, Bpa-Free And Lead-Free.